Home / sponsored / Travel Forever on $20 a day! Revolutionary new travel book shows everyone regardless of current financial condition how to camp, travel and live forever anywhere in the United States on $20 a day. Author Jason Odom and his wife Kelly have traveled over 700,000 miles in 15 years enjoying the sumptuous beauty of pristine national parks and the exciting nightlife of big cities like San Francisco and Las Vegas. 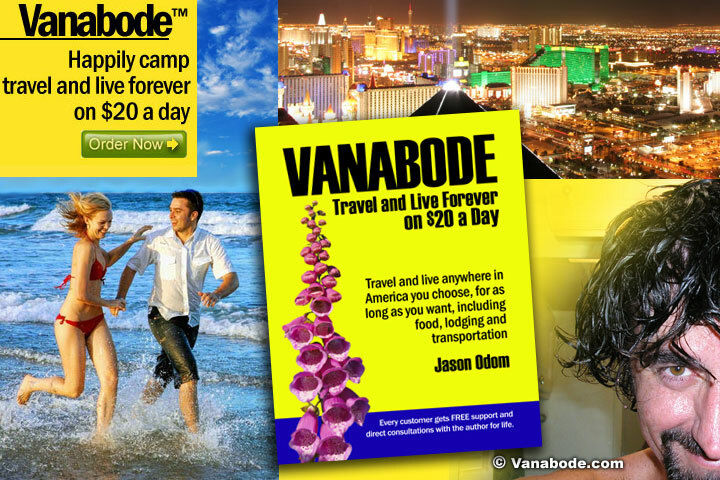 Vanabode shows you how to earn a living working in some of the most exciting places in the United States like national parks and state recreational areas, how to sleep safely and comfortably in your own bed every night; how to eat better than you ever have, how to cook for free without electricity, fire or fuel; how to get rid of all our current debt and regain your freedom; and most importantly – how you can do it forever if you want. Do you want to travel for 3 months? How about 3 years? Vanabode shows you how. Previous Create additional serving space you desire with CookTop Cover.